Keeps colours bright, tough on stains. Cares for colours and fibres. Helps remove stains like grease, mud and chocolate ice-cream. Removes stains even in a quick wash and works efficiently at lower temperatures. Stain Eraser Dosing Ball can be used for measuring and pre-treating stains. 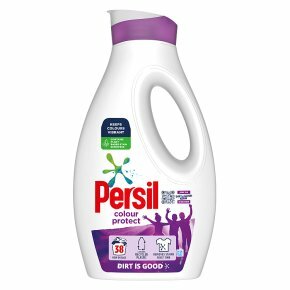 Have you tried the full Persil Colour range? Also available in powder, capsules and powergems. When you?re trying to put the laundry on in a rush, it?s easy to get detergent everywhere. Persil Colour Liquid Detergent has a specifically designed bottle and ball to help minimise spills. Our unique formula gives you powerful stain removal, without letting colours fade. We take the pain out of removing stains. With our washing liquid you can put your colour clothes on a 30 C wash, and still easily get rid of marks like mud, grass and ice cream. And for any really stubborn stains, you can use our dosing ball, which we have designed to help you pre-treat your clothes. Rub in washing detergent with the ball?s textured bottom to help break up stains easily, so you can spend more time having fun with your kids! How do I use it? Try using Persil liquids as a pre-treatment and in your washing machine. First sort your laundry by colour. If this is the first time you?re using the bottle remove the safety cap by gently peeling towards spout, then throw away. To pre-treat, simply pop the ball out of the bottle, pour a small amount of washing liquid directly on the stain, then rub with the bottom of the ball to help loosen the stain. Next, put your pre-treated clothes in the machine with the rest of your wash, pour washing liquid into the ball (check the bottle as this changes with load size) then place the filled ball on top of your clothes. Don?t use this product to treat delicate fabrics like silk or wool.